Amazing Colossal Episode Guide entry for 706 LASERBLAST, written by Mike, Paul, Mary Jo and Kevin. Directed by Michael Rae. Written by Franne Schacht and Frank Ray Perilli. Starring Kim Milford, Cheryl Smith, Gianni Russo and Keenan Wynn as Colonel Farley. The Ages of the Show: First is KTMA, Second is first cable season, Third is Season 2 through to Joel leaving, Fourth is Mike's arrival as host through to Frank leaving, and Fifth is Season 7. From here, the rest of the classic run, the Sci-Fi Channel era, is the Sixth Age. I would say that Season 11 is the Seventh Age, but maybe we're experiencing age inflation? The opening to the episode is a bit near and dear to my heart. The commercial bumpers for this episode show the SOL on its trip through the universe, contrasting with the shots of it orbiting Earth in 705. 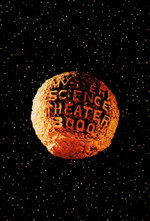 BTW, MST3K is going out on tour, woo! The host segments are nicely done. The theater stuff is okay. The movie is kind of unpleasant. Chrysostom, I can't help feeling that you're just not ready for some football. Mystery Science Theater 3000 Mark V: Jazz Odyssey!